This article is created to help you remove Sage 2.2 ransomware virus from your computer and try to restore files encrypted with the .sage file extension added to them. “!HELP_SOS.hta” is the file which users see on every folder with important files encrypted by the latest version of Sage ransomware. This virus is from the file encryption type, meaning that it renders the files on the computers it infects unable to be opened. Sage has lately seen more popularity primarily because of the fact that the virus was reported to be spread via a very massive spam campaign of e-mail spam messages, carrying .zip archives with malicious documents or .js scripts in them. In case you have become a victim of the Sage 2.2 ransomware virus, we recommend you to read this article and learn how to remove Sage 2.2 and restore files encrypted with the .sage file extension. SensorsTechForum team is actively investigating the 2.2 version of Sage. More information will be available in the hours to come. 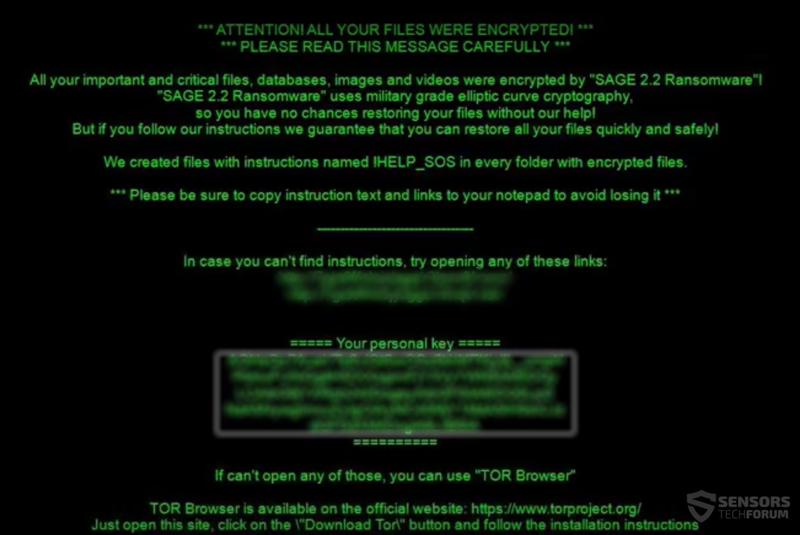 Short Description This ransomware infection is an updated version of the Sage 2.0 ransomware. Encrypts files on the compromised computer and asks the user to visit a TOR-based web page for further instructions. Symptoms The user may witness ransom note, named !HELP_SOS.hta and the important files on the computer may be encrypted with an added padlock icon on them. User Experience Join our forum to Discuss Sage 2.2. “Suspicious activity on your online bank account. (Bank Name)”. A Microsoft Office document .doc file which causes an infection when you click on Enable Content button to enable macros. These macros have malicious script in them. After the moment the user PC has been infected by the Sage 2.2 virus, an unsecured port may be used to connect to the cyber-criminals distribution sites and download the payload on the infected computer. The only ay you can do that is by getting “SAGE Decrypter” software and your personal decryption key. The ransom note of the virus also has a web link which of course leads to Sage ransomware’s decryption page, which has not changed much. The web page is still well-developed, like in the Sage 2.0 version. Before performing the removal process of Sage ransomware, recommendations are to focus on performing a back up of the encrypted files on a removable drive or in the cloud. Then, we recommend following the removal instructions below. They are created with the one and only purpose of assisting you isolating the virus in Safe Mode and then locating the malicious files of Sage 2.2 ransomware. For maximum effectiveness during the removal process of Sage 2.2 ransomware, researchers recommend using the automatic approach and scanning for the virus by downloading an advanced anti-malware program. After having removed Sage 2.2 ransomware, it is strongy advisable to try and recover the encrypted files using some alternative methods, since at the present moment direct solution for free is not available. We have suggested some of those tools in step “2. Restore files encrypted by Sage 2.2” but we recommend you to use them on your own risk. Threats such as Sage 2.2 may be persistent. They tend to re-appear if not fully deleted. A malware removal tool like Combo Cleaner will help you to remove malicious programs, saving you the time and the struggle of tracking down numerous malicious files. Threats such as Sage 2.2 may be persistent on your system. They tend to re-appear if not fully deleted. A malware removal tool like SpyHunter will help you to remove malicious programs, saving you the time and the struggle of tracking down numerous malicious files. Note! Your computer system may be affected by Sage 2.2 and other threats. SpyHunter is a powerful malware removal tool designed to help users with in-depth system security analysis, detection and removal of threats such as Sage 2.2. 1. Install SpyHunter to scan for Sage 2.2 and remove them. 2. Scan with SpyHunter, Detect and Remove Sage 2.2. Ransomware infections and Sage 2.2 aim to encrypt your files using an encryption algorithm which may be very difficult to decrypt. This is why we have suggested several alternative methods that may help you go around direct decryption and try to restore your files. Bear in mind that these methods may not be 100% effective but may also help you a little or a lot in different situations. Note! Your computer system may be affected by Sage 2.2 or other threats. Remove Sage 2.2 by cleaning your Browser and Registry. Fix registry entries created by Sage 2.2 on your PC. Combo Cleaner is a powerful malware removal tool designed to help users with in-depth system security analysis, detection and removal of threats such as Sage 2.2. Step 5: In the Applications menu, look for any suspicious app or an app with a name, similar or identical to Sage 2.2. If you find it, right-click on the app and select “Move to Trash”. Step 6: Select Accounts, after which click on the Login Items preference. Your Mac will then show you a list of items that start automatically when you log in. Look for any suspicious apps identical or similar to Sage 2.2. Check the app you want to stop from running automatically and then select on the Minus (“–“) icon to hide it. Remove Sage 2.2 – related extensions from your Mac’s browsers. A pop-up window will appear asking for confirmation to uninstall the extension. Select ‘Uninstall’ again, and the Sage 2.2 will be removed. When you are facing problems on your Mac as a result of unwanted scripts and programs such as Sage 2.2, the recommended way of eliminating the threat is by using an anti-malware program. Combo Cleaner offers advanced security features along with other modules that will improve your Mac’s security and protect it in the future. va a salir algo que desencripte los archivos infectados en el futuro cercano? can you help me with the method 4 please? i dont know what to do with this, will a decryption key come in teh near future? unfortunately, all onion websites traffic goes through the Tor network, meaning through random machine every time. These machines are called nodes and the only ones who can track traffic this way are the people in control of the exit nodes of the Tor network, which is not just everyone. Well, if you have the decryption key, contac me and I will research a method to see if it can be factorized. how did you remove it? and did you get back your files? is there any way to recover sage affected files? all anti virus anti malware and data recovery software cost more than my PC.The manual methods are not working as system restore icon itself have gone missing. Hey !, I found this information for you: "Sage 2.2 Ransomware (Restore .sage Virus Files)". Here is the website link: https://sensorstechforum.com/sage-2-2-ransomware-restore-sage-virus-files/. Thank you.